Dreamsicle or creamsicle? I never know which it is. What I do know is that the combination of creamy vanilla and orange is amazing. I know that every time I hear the ice cream truck singing on the next block, I’m going to grab my stack of quarters, have a moment of gratitude for the fact that ice cream trucks still exist, and run out to the street to buy my favorite ice cream treat. I’d encourage you all to do exactly the same. The only problem is, when you invite friends over for dinner, you can’t count on the ice cream truck pulling up at the exact moment you clear the dinner plates. Especially, if it’s only April. And slurping a dreamsicle in a candlelit dining room seems a little strange. But I’m all about solutions to everyday problems, so I came up with dreamsicle panna cotta. 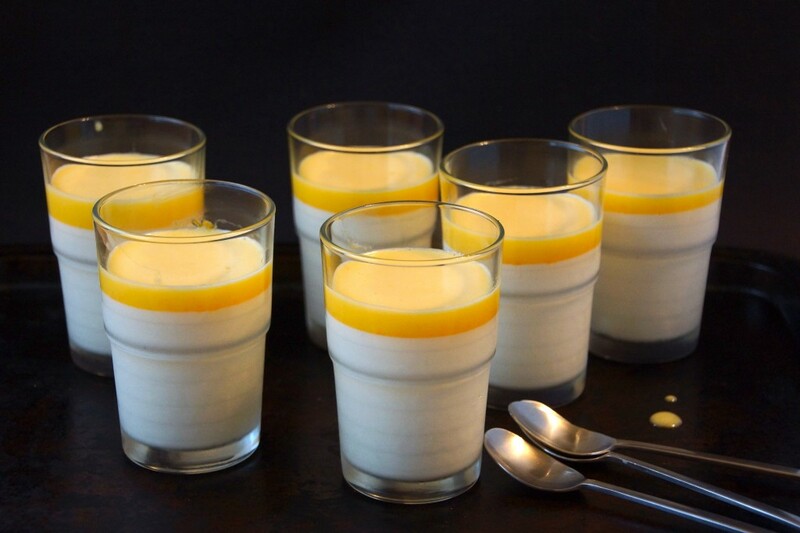 It’s a creamy, dreamy vanilla bean panna cotta, topped with orange curd. It’s the deliciousness of our favorite ice cream treat, dressed for a proper dinner. Translated, panna cotta simply means “cooked cream” and that’s (almost) all it is. Just sweeten the cream and cook it with a bit of gelatin and a vanilla bean. Pour it into glasses and let it chill until it sets. That’s all there is to it. You can make it a day ahead of time, so serving dessert is effortless. Now obviously, it wouldn’t be a dreamsicle panna cotta without the addition of orange. Perhaps you remember a few weeks ago when I made lemon curd and warned you I’d have other fruit curds on my mind. Orange curd is a similar beast. We’ll make it in the same manner as the lemon curd, just with less sugar since we’re dealing with a sweeter fruit. Zest and juice an orange. Combine with butter, sugar, egg yolks, and a splash of Grand Marnier and whisk over simmering water until the curd starts to thicken. Let the orange curd cool and layer it over the vanilla panna cotta. Done! The glory of a dreamsicle, without having to wait for the ice cream truck. The panna cotta and the orange curd can both be made a day before you plan to serve them. Place ½ c. of the milk in a medium saucepan and sprinkle the gelatin over it. Let it sit for 5 minutes, until the gelatin softens. Cook over low heat, stirring, until the gelatin completely dissolves. Add the remaining milk, cream, and sugar. Cut the vanilla bean in half, scrap the seeds out and add to the pan, along with the pod. Cook over medium heat until the cream just starts to steam. Remove from heat, cover, and allow to steep for 20 minutes. Remove the vanilla pod and pour the panna cotta into custard cups or glasses. I used 6 juice glasses. In retrospect, I would have chosen a squatter glass so there would have been a little more surface area for the orange curd to cover and allow for more a better ratio of orange to panna cotta in each bite. Next time! Transfer the panna cotta to the refrigerator and chill until set. For the orange curd, combine all of the ingredients in a medium, heatproof bowl and set over a saucepan of simmering water. Whisk until the butter melts and the sugar dissolves. Continue to cook, stirring frequently, until the mixture thickens enough to coat the back of a spoon, about 30 minutes. Cool completely. 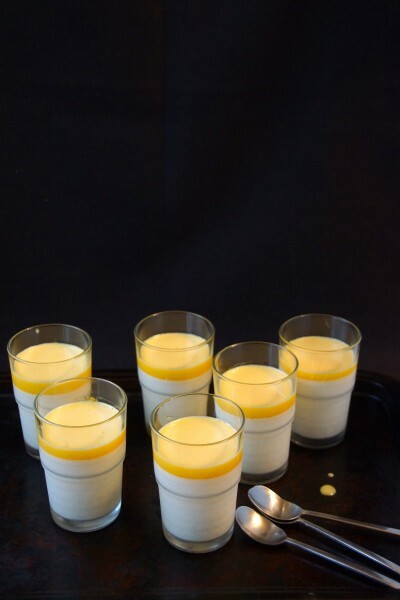 Spoon the cooled orange curd over the chilled panna cotta and serve. Thanks for being my official recipe tester!